The Master Gardeners who work in the FOHC vegetable garden planted and tended a second straw bale garden demonstration in 2014 using the book Straw Bale Gardens (Joel Karsten, 2013, Cool Springs Press) as a reference. The pumpkins that were grown in 2013 were such a success, and there was so much interest from home gardeners, that we decided to give it another try. The only difference this year is that we used rice straw; last year we used wheat straw. It is important to use straw rather than hay because hay does not have the same water-holding capacity as straw (straw is hollow) and it contains a lot of seeds. Straw bales are not just the container, but also the growing media. As the straw inside the bale decomposes, it provides nutrients for the plants, then the next year, whatever is left of the bale is used as mulch in our raised beds. The spent bales from the 2013 experiment were used as mulch around all of the vegetables in our raised beds during the 2014 summer. 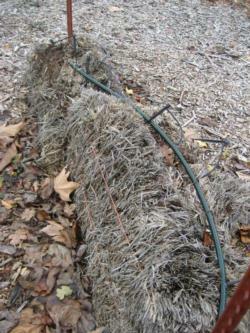 The straw mulch was applied quite thickly because of the drought. As in the 2013 demonstration, two bales of straw were placed cut side up, end-to-end as set out in the Straw Bale Gardens book. We also installed concrete reinforcement wire to act as a trellis for the plants. We started out by “conditioning” the bales, which is the process of getting the bales to compost internally so root growth can be supported. Using a very precise 3 week fertilization and watering schedule as set out in the book, blood meal, feather meal, bone meal, and kelp meal, (all organic fertilizers) were applied and watered in. We chose to use organic fertilizers, but a high nitrogen lawn fertilizer could be used as well for a little faster, non-organic, conditioning process. The temperature of the interior of the bales was taken each day during the conditioning process, and we noticed that it did not heat up as much as the wheat straw in 2013; however, it did heat up enough to activate bacteria inside the bales to start the decomposition of the straw. 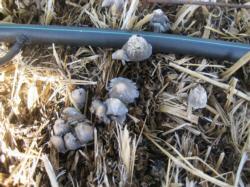 At the end of the conditioning process, mushrooms appeared on the surface of the straw, a sign that the inside of the bale had decomposed nicely (see photograph at right). On May 7, 2014, "Rainbow Sherbet" icebox watermelons were planted into the straw (seeds from Renee's Garden). "Rainbow Sherbet" consists of pink 'Tiger Baby', orange 'New Orchid', and yellow 'Yellow Doll'. The plants were trained up a trellis and the fruits were supported with slings cut from old t-shirts. The same irrigation method (shrubblers attached to ½-inch supply line) and fertilization schedule (monthly fish emulsion) that were used in 2013 were again used in 2014. We had difficulty keeping the strings that bound the straw bales tightened. It is important to keep the strings tight or compression will be lost and the interior of the bales will dry out. Our remedy was to cut the strings and attach several turnbuckles to the strings so we could periodically tighten them. Still, we found that much of the rice straw disintegrated within a few months of planting. One bale collapsed and had to be propped up with metal stakes (see photo at right). While all straw decomposes over time, the rice straw seemed to decompose more rapidly than the wheat straw that we used in 2013. Therefore, next year we will try to obtain wheat straw for our 2015 straw bale demonstration; however, if only rice straw is available, we will use it and plan appropriately to support it. Conclusions: Growing vegetables in straw bales is a great way if your soil has problems (too much clay, soil-borne diseases like verticillium or fusarium wilt or nematodes, weeds that are difficult to eradicate) or if your vegetable garden is in too much shade and you need the flexibility to move the straw bales to a sunny location. 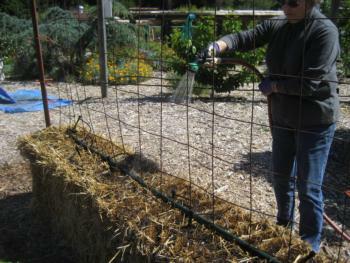 Also, because the straw bales are about 2 feet tall, they are instant (and relatively inexpensive) raised beds with all of the accompanying benefits: less labor (no cultivating or weeding), good drainage, easier on the back (those of us of a certain age or with physical limitations appreciate that less bending is needed). If trellises are installed, plants can be grown vertically, making harvesting the crops very easy.